Designed for children aged 6 to 15, the Children’s Education Programme at Sharjah Art Foundation offers art workshops and other activities conducted by professional specialist artists working in a broad range of visual and performing arts. The aims of the programme are to teach children technical art skills and strengthen their creative expression. Running from 16 March to 4 May, this season’s Children’s Education Programme offers a variety of workshops that are inspired and informed by the work of Sharjah Biennial 14 (SB14) artists. The workshops provide participants with a wide range of choices, including photography, painting, writing and performance, which will allow them to explore different techniques and mediums of self-expression and creativity. The SB14 Children’s Education Programme will take place at the Art for All Center, unless otherwise noted. 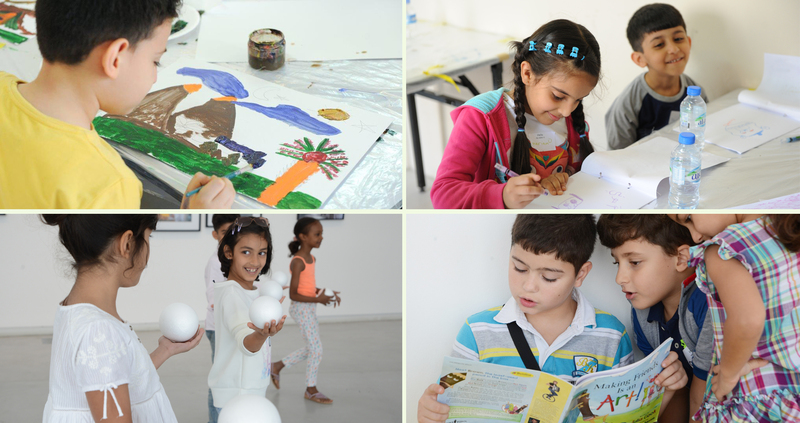 Designed for children aged 6 to 15, the Children’s Education Programme at Sharjah Art Foundation offers art workshops and other activities conducted by professional specialist artists working in a broad range of visual and performing arts. The aims of the programme are to teach children technical art skills and strengthen their creative expression. Running from 22 December 2018 to 23 February 2019, the Winter 2019 Children’s Education Programme will take place at the Collections Building in Arts Square, unless otherwise noted. Designed for children aged 6 to 15, the Children’s Education Programme at Sharjah Art Foundation offers art workshops and other activities conducted by professional specialist artists working in a broad range of visual and performing arts. The aims of the programme are to teach children technical art skills and strengthen their creative expression. Running from 8 September to 24 November, the Autumn 2018 Children’s Education Programme will take place at the Collections Building in Arts Square, unless otherwise noted. Designed for children aged 7 to 15, the Children’s Education Programme at Sharjah Art Foundation offers art workshops and other activities conducted by professional specialist artists working in a broad range of visual and performing arts. The aims of the programme are to teach children technical art skills and strengthen their creative expression. Running from 17 March to 12 May 2018, the Spring 2018 Children’s Education Programme will take place at the Collections Building in Arts Square, unless otherwise noted. The Children’s Education Programme at Art Centres for spring 2018 is scheduled from 4 March to 15 May. Designed for participants aged 6 to 15, the courses and workshops cover various aspects of contemporary art practices and introduce participants to different methods of learning. Materials used in courses and workshops will be provided by the foundation. For a detailed Sharjah Art Institute's schedule please click here. For a detailed ِArt Centres' schedule please click here. All workshops and activities are stand-alone sessions and will include a tour of Sharjah Biennial 12. The programme takes place every Saturday, from 14 March through 30 May, 2015. Designed for children aged 7 to 15, the Children’s Education Programme at Sharjah Art Foundation offers art workshops and other activities conducted by professional specialist artists working in a broad range of visual and performing arts. The aims of the programme are to teach children technical art skills and strengthen their creative expression. Running from 9 July to 18 August, the Summer 2018 Children’s Education Programme will take place at the Collections Building in Arts Square, unless otherwise noted. Designed for children aged 7 to 15, Sharjah Art Foundation Children’s Education Programme offers art workshops and courses conducted by professional specialist artists working in a broad range of visual and performing arts. The goal of the programme is to teach children technical art skills and strengthen their creative expression. Running from 10 July to 26 August, the summer 2017 workshops and courses will be held at the Collections Building in Arts Square, unless otherwise noted. The Children’s Education Programme offers a series of summer workshops for children of all ages. Taught by professional artists, the workshops and short course are designed to encourage participants’ creativity, develop their communication skills and enrich their knowledge of art. The 2016 summer education programme, which runs in parallel with Sharjah Art Foundation exhibitions such as Vantage Point, takes place from 11 July to 31 August. Children's Education Programme for the Summer of 2015 provides a set of tailored programmes for your children. The workshops will be taught by professional artists, and they are designed to encourage participants to be creative and to enrich their knowledge of art and enhance their art and communication skills. Children will learn new methods of art making and create their own artworks.The programme runs from 3 August through 5 September, 2015. Summer 2015 children education programme celebrate Sharjah’s selection as the capital of Islamic culture for 2014 by running workshops and activities for children. All workshops and activities are open to the public Sunday to Thursday from 9:00am-5:00pm. Designed for children aged 7 to 15, the Children’s Education Programme at Sharjah Art Foundation offers art workshops and other activities conducted by professional specialist artists working in a broad range of visual and performing arts. The aims of the programme are to teach children technical art skills and strengthen their creative expression. Running from 16 December 2017 to 24 February 2018, the Winter 2018 Children’s Education Programme will take place at the Collections Building in Arts Square, unless otherwise noted. Designed for children aged 7 to 15, Sharjah Art Foundation Children’s Education Programme offers art workshops and other activities conducted by professional specialist artists working in a broad range of visual and performing arts. The goal of the programme is to teach children technical art skills and strengthen their creative expression. Running from 16 September to 25 November, the Autumn 2017 Children’s Education Programme will take place at the Collections Building in Arts Square, unless otherwise noted. The Sharjah Art Foundation (SAF) Children’s Education Programme offers art workshops and courses facilitated by professional and specialist artists in all fields of art. The workshops and courses aim to develop children’s technical skills in art and foster creativity. The Winter 2017 programme, designed for children aged 7 to 15 years, runs from 2 January through 28 March in parallel with the SAF March Project 2016 exhibition, which features site-specific works developed by five young artists: Noor Abed, Ammar Al Attar, Vikram Divecha, Reem Falaknaz and Bassem Yousri. This annual education residency programme welcomes artists from a range of countries, including Egypt, Palestine and the United Arab Emirates. For a detailed schedule please click here . The Sharjah Art Foundation (SAF) Education Programme for Children offers art workshops and courses facilitated by professional and specialist artists in all fields of art. The workshops and courses aim to develop children’s technical skills in art and foster creativity. The autumn 2016 programme, designed for children aged 7 to 15 years, runs from 24 September through 31 December in parallel with SAF exhibitions Arnulf Rainer: Towards Overpaintings, Kamal Youssef: Egyptian Surrealism’s Time Capsule, Yayoi Kusama: Dot Obsessions, Robert Breer: Time Flies, Enrico David: Fault Work, The Khartoum School: The Making of the Modern Art Movement in Sudan, Kamala Ibrahim Ishaq : Women in Crystal Cubes A Retrospective (1965-Present) and Amir Nour:Brevity is the Soul of Wit. The Education Programme provides a set of programmes for your children. The workshops will be taught by professional artists, and are designed to encourage participants' creativity, develop their communication skills, and enrich their knowledge of art. The autumn programme runs from 19 September through 5 December, 2015. Sharjah Art Foundation’s education programme offers a variety of learning experiences featuring workshops, activities and events that help students build creativity and confidence. Taught by professional artists, SAF’s education initiative is designed in response to themes within it is ongoing exhibition programme from 20 September, 2014 through 21 February, 2015. Sharjah Art Foundation’s education programme offers children the opportunity to discover their artistic creativity while learning about art and culture. Through a variety of learning experiences featuring workshops, family concert series and a children’s library, SAF's multi-disciplinary approach helps students build art knowledge, creativity and confidence. Taught by professional artists, the programme runs from 28 September through 5 December, 2013. The Education Programme provides a set of programmes for your children. The workshops will be taught by professional artists, and are designed to encourage participants' creativity, develop their communication skills, and enrich their knowledge of art. The Spring programme runs from March 19 through May 21, 2016. This programme marks Sharjah’s selection as the capital of Islamic culture for 2014.